2nd night in a row of being out and there is going to be no rest tonight, it’s our own Jazz in the Courtyard event, I suspect I will start to feel a bit worse for wear tomorrow! Despite all the stress of the build up to DAW – both in terms of my own studio being open and in my role as Chairman of DAW / DVA I do really enjoy these two weeks. Perhaps more so now that we have a great team in Jem Main and Suzy Rushbrook running the event, they have busted a gut the last few months and the event, brochure and good vibes are largely down to them. Ok, so while I’m at it I may as well thanks all those other unsung hereos of DAW who work so hard behind the scenes. The local area contacts, or DVAC’s as they are known, are the ears and eyes on the ground organising artists in groups of 20 to 40. Then there are the Trustees of DVA, made up of brilliant people who are artists, makers, educators, those involved in the media and business. Last but not least is our design team, run by Giles Vincent at We Are Creative. 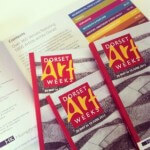 He is responsible for the brochure, graphics, signage, website and just about everything else you see related to Dorset Art Weeks. Back to the Courtyard Workshop and Gallery, one thing I noticed on Friday’s PV was that just like a good party where things always happen in the kitchen, our secondary gallery space always seemed to be more full than the main space. That space is our hand working area which we cleared out and made a bit of effort with, Mike and John are now working in the machine shop. It’s worked out fine as we are just starting new stuff – a back kitchen area and a stair balustrade. Visitors have been steady throughout the day, 45 or so after a slow Sunday start with a deadly quiet bit in the middle. We were expecting that as we know plenty are holding off until tonight. The afternoon was livened up with the rattle and hum of Jalopy Pizza arriving in their classic old Peugeot J7 van. It took two hours to get the woodburner up to heat, with the eager help of no.1 son George helping (ish). He rolled the first couple of test pizzas which we obviously had to try! Properly good pizza, best i’ve tasted outside Italy. 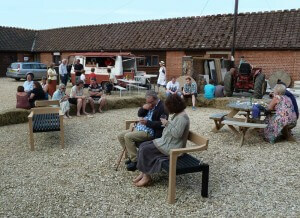 Not long after that the bar arrived, then the band, then the punters and friends. No-one was counting numbers, but we must of had 100, with plenty of families. It was a lovely atmosphere. Not all play though, we were busy inside the gallery as well. We all sold stuff and have had good leads to pursue. 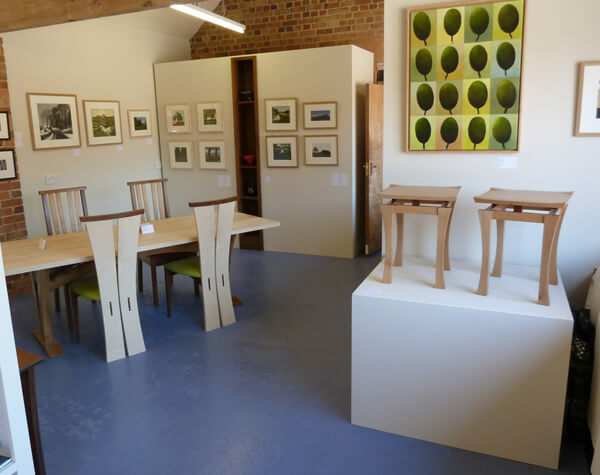 I sold a pair of elm Torii tables and got another 2 bids on the coda side tables in the auction. For full details of what’s in the auction and current bids click here. So a great night, feeling stuffed now and think I better get a lift home. 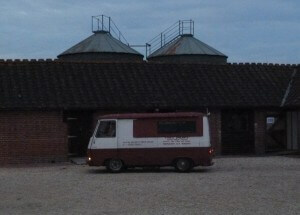 Apart from us the Jalopy crew were last to leave, rumbling back to Bridport with the smell of pizza still eminating from the wood oven chimney. That must have been a hot journey, I don’t think that old van is the fastest thing on the road. Like to think I’ll sleep well tonight, lets see if the kids are going to allow that!